Jan provided wonderful detailed information in advance of our stay. We had no trouble finding the building, which is situated close to the bridge. 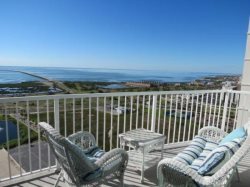 The unit is in a condominium and has a lovely view of the ocean and pool. . The unit had absolutely no issues, had lovely views, and accommodated our family of 6 perfectly. We are extremely grateful for Jan's problem-solving and responsiveness. We look forward to visiting South Padre Island again and would definitely come back to Unit 2204 at Sapphire. When we arrived at 2204 we enjoyed every minute of our stay.